At Abilene Family Dentistry, we’re equipped to meet your oral health needs, but our compassionate and gentle approach is what will exceed your expectations. We know that if you’re requiring any type of oral surgery, those are very important qualities to find, and we’d want just the same. Our investment in advanced technology helps us map out treatment plans with precision, and our goal to help you recover quickly and feel thoroughly satisfied with your results means we’ll make those treatment plans as non-invasive as possible. Additionally, we offer sedation dentistry to help our patients relax in the chair. If extraction is deemed necessary for you, we promise to do all we can to make it a comfortable procedure. Third molars, commonly called wisdom teeth, can be quite puzzling. Some people have them erupt with no issue, and others may not even be born with them. 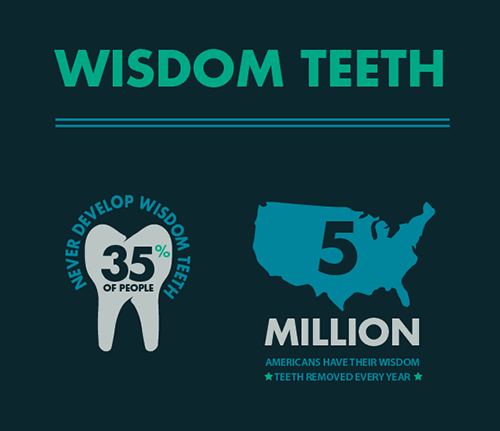 Each year in the United States, five million people have one or more wisdom teeth removed. Why is there so much variation? Well, most jaws just don’t have the space to welcome them. Some sets are stubborn though, and as a result of trying to fit where there isn’t enough room, they become impacted. Wisdom teeth impaction can present with your third molars moving upward at an angle toward your second molars or pushing at them in a completely horizontal position. This pressure can cause your teeth to shift, which in turn can alter your bite and cause TMJ dysfunction. This is not a painless process, and if they erupt partially it can be an invitation for bacteria to enter and cause an infection—this equals more pain. To negate these outcomes, many dentists and oral surgeons will recommend their removal. 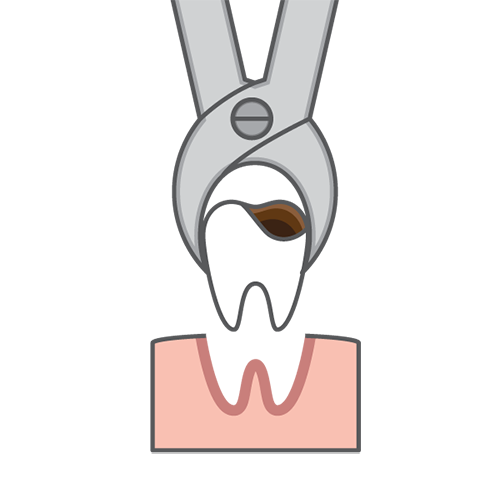 Third molar removal is a procedure that is best to perform between the ages of 17-25, the age range when they tend to reveal their position and haven’t gotten the chance to grow a more extensive root system. It’s also recommended during these years because as we age, our healing processes slow down. We want you (or your teenagers) to be able to bounce back quickly. If you have excess gum tissue or are in need of treatment that requires you to have more healthy tooth structure to serve as a base for restorative or cosmetic services, Dr. Webb and Dr. Awtrey can perform crown lengthening. We use a diode laser for precise, virtually painless tissue removal that doesn’t require a scalpel and sutures. An added benefit to using the laser for crown lengthening is its bacteria killing power. That’s right—diode lasers can be used to treat gum disease, too. If you read our Dental Implants page, you know that one of the worst consequences of missing teeth is how it causes your jawbone to deteriorate. Without the natural stimulation created by the force of chewing food, the bone not only stops growing, but can reduce in width by 25% in the first year after you’ve lost a tooth. This causes a decrease in gum tissue as well, which further limits your options for tooth replacement. Bone grafting is done to accomplish a regeneration of bone that can make you a candidate for dental implants. Each bone grafting procedure will vary based on the bone being used (whether it’s from another part of your body, a donor’s, made of synthetic materials, or from a non-human donor) to the degree of bone loss, the location its needed in your mouth, and how long after tooth loss the grafting is taking place. The benefits of bone grafting include its ability to restore the shape and contours of your face, stimulate new bone growth, support dental implants, and stabilize dentures. Dr. Webb and Dr. Awtrey will answer any questions or concerns you have about the procedure and make you as comfortable as possible throughout the process if it’s part of your treatment plan. There are two types of smile makeovers that may involve multiple different types of treatments, customized according to your goals and budget. The first, Smile Design, is achieved through cosmetic dentistry, and the other, which restores function to your smile as well, is called Full Mouth Reconstruction or Rehabilitation. Maybe genetics, a factor beyond your control, have made your teeth a source of pain since childhood, or you’ve suffered an illness or traumatic injury. Even habits like teeth grinding over the years can make you a candidate for full mouth rehabilitation. What we love about our role as your oral healthcare providers is our ability to bring back your smile regardless of what may have taken it away. We have the advanced technology, comprehensive service menu, and compassionate, caring touch needed to get your oral health back on track, or on track for the first time. Full mouth reconstructions begin with thorough consultations. You’ll sit one-on-one with Dr. Webb or Dr. Awtrey to come up with a plan that works for you. Our discussion will take a look at underlying issues as well, because we want to create an environment that helps your healing process along and keeps your renewed smile strong. We can combine surgical and restorative techniques based on what you need to create a healthy, beautiful, long-lasting smile. If you have any questions about oral surgery or you’re ready to schedule a consultation with your Abilene dentists, Dr. Webb and Dr. Awtrey at Abilene Family Dentistry, give us a call today or request an appointment online. Restoring health and confidence in your smile fills us with pride!